The foundation of every great team is a direction that energizes, orients, and engages its members. Teams cannot be inspired if they don’t know what they’re working toward and don’t have explicit goals. 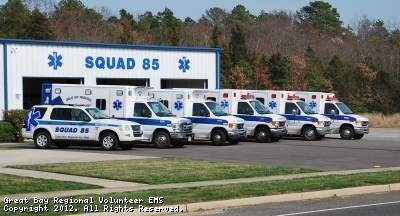 Stafford Township EMS holds a long lasting relationship with our neighboring towns, especially Little Egg Harbor, where Great Bay Regional EMS is located right in the heart of their town. Just like Squad 38, Squad 85 answers a great deal of calls day in and day out, 24 hours a day and 7 days a week. Stafford EMS has built their relationship exceptionally with Great Bay and vise versa. With the amount of calls that come in from both towns, it can sometimes be extremely difficult to find the manpower to answer them. In the past year, both Squad 38 and Squad 85 help each other whenever possible, going out of our jurisdictional boundaries in a planned and safe manner and while maintaining reasonable levels of coverage in our respective coverage areas. Great Bay Regional EMS, which is under the command of Captain Jay Zimmerman, responds to emergencies in Bass River, Eagleswood and Little Egg Harbor Township, not including the 13 miles of coverage on the Garden State Parkway from exit 48.4 to 61.5. In this kind of work, teamwork is key. You build a bond with people from every which way which makes everything worth it. Teams are defined as two or more individuals who interact and coordinate their EMS work to accomplish a shared goal or purpose. Our members are unique individuals who share common goals and who coordinate their activities to accomplish the goals and response requirements. Our organizations leaders keep the team focused on the goals, which is essential to building a collaborative climate so our members can stay focused, be open with one another, listen to each other, feel free to take appropriate risks and be willing to compensate for each other. In the past year, Stafford Township has accumulated over 80 members into our organization, giving the ability to show everyone what it is like to work side by side with other organizations and how a solid structure of team work can be formed simply by hard work and dedication.